Meet my Aunt Helen. She’s 62 years old, recently retired, and soon to be a grandmother (I would say overdue, in fact). She’s also rocking out at concerts solo. Here’s the deal. I’ve always known that Aunt Helen has been watching concerts since her recent retirement, but I assumed it was the typical montage for someone her age – symphonies, operas, old generation Chinese pop singers, and generally artists I didn’t think were still alive. Last week, she told me she recently saw a younger rock band named “Heidi”. Curious, I prodded her for more information on “Heidi”, and she produced a T-shirt she caught off stage. 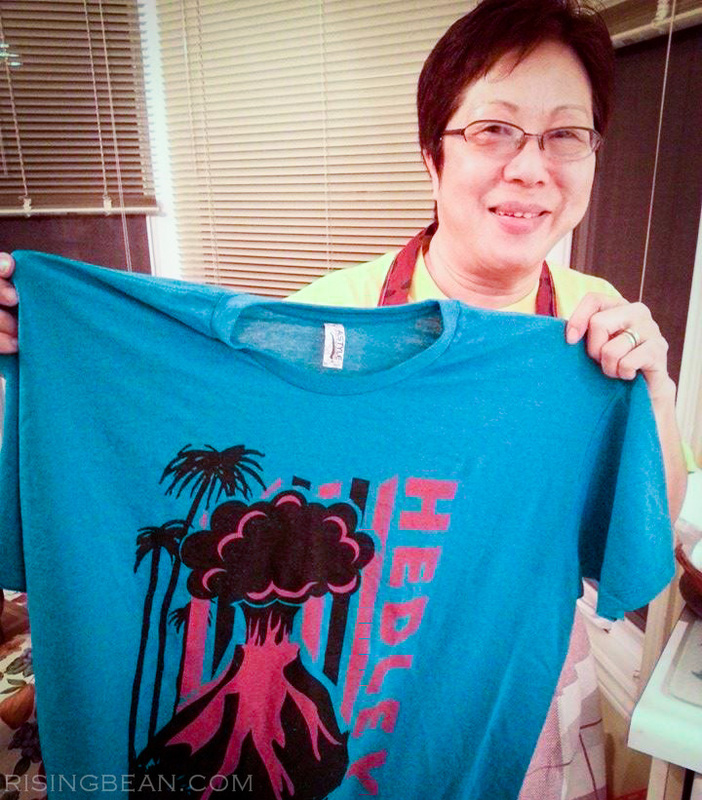 The t-shirt screamed Hedley, rock superstars extraordinaire. Did I mention she was on the floor solo while surrounded by screaming teenagers? Going against all stereotypes and fears, I was blown away by Aunt Helen’s awesomeness. I put together a quick interview, partly conducted in Chinese, so I’ve done my best to translate her thoughts. Why did you choose Hedley? I actually love all kinds of music. All the artists that I would normally go to see concerts for, such as Paul Anka or Frank Sinatra, are either retired or have passed away, so I started looking for “new generation” music. Not knowing where to start, I just went by the number of reviews on the Ticketmaster website. Hedley had over 700 positive reviews, so by my rules, that was good enough to buy a ticket to see them. There was a chance that I might have disliked Hedley, but since so many people loved their shows, it gave me the impression that there would be a good chance I would like it too. Were you the only person of your age there? Yes, when I went, I was surprised that the people on the floor were very, very young, mostly tweens. I’ve never listened to Hedley before and didn’t know what to expect. I was definitely the only senior citizen on the floor, maybe even the only the person over 40. There were a handful of women in their 30’s, but they were accompanying their tweens. I think I was also the only Asian person there too. Did being out of place bother you? No, I was there to see Hedley and for the music, just like everyone else. At my age, I don’t really care what other people think of me. It wasn’t that awkward. Did you mind going alone? It was a little awkward with the young crowd at first, but it didn’t bother me that much. It’s just a state of mind. I went alone because it’s too much trouble to go with a friend, since not many care about new music, it’s a pain when they cancel, or some friends often complain and it affects my enjoyment. I like to make my own opinions about the music I’m listening to. Yes, I liked them very much. I was worried because the opening bands were kind of lousy (sorry!). I almost left before Hedley performed because of them. But once Hedley came on stage, they put on a really good show, and I enjoyed it very much. The performance was really, really good. The girls on the floor were yelling, screaming, jumping, and the energy was amazing. Everyone was standing up, so I had to stand up to see too. Dance and music are my two most favorite activities, so combining them is perfect. I enjoyed joining the party. I’ve seen other rock concerts, but Hedley is a band I would see again. Do you wish you did this earlier? Because of my busy lifestyle, I couldn’t do it before. I have no regrets raising a family. I’m not trying to relive my youth. I just want to discover good music that I might be missing. How did you score the T-shirt? My seat was really close to the catwalk/stage. They used the t-shirt cannon, one just fell at my feet, and I picked it up. Blue Rodeo, Michael Buble, Madonna, Nana Mouskouri, and many jazz artists. What parting advice can you leave us with? If you want to try something, and it’s not physically dangerous, then by all means, go for it. Don’t wait. Enrich your life. Listen to music. Travel. Collect experiences. Give everything a try. As hilarious as the story is, I think that her courageous mentality illustrates the importance she places on truly living in the moment. I’m so proud to have her as my inspiration to be unafraid to try something new (and possibly terrifying) when the opportunity arises. Hopefully, the image of my mom bopping along fearlessly to punk-rock tunes in an audience of teenagers is enough to inspire you to do something today that’s completely outside of your own comfort zone too. Wow, go grandma (to be)! Ive gone for something I didnt think id do recently too, slightly more dangerous though – a charity skydive in aid of cancer research uk!